Have you ever tried to grow a plant but it ended up dying even though you watered it and gave it enough sunlight? Beyond the basics of water, light, and CO2, plants also need other nutrients. 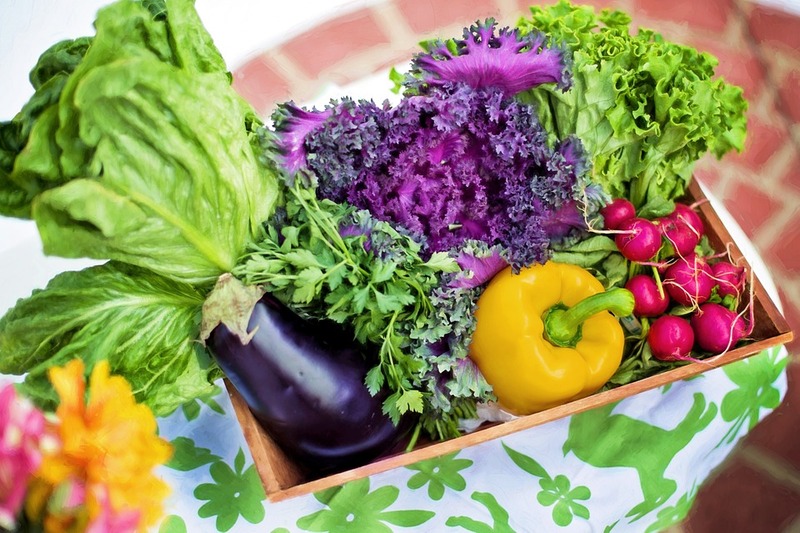 Nitrate (NO3–) is a nutrient that plays a key role in plant development and health. Plants use the nitrogen contained in nitrate in the production of amino acids and proteins, which allow them to function as living organisms. Nitrates are not found naturally in nature, but are in fact created by a type of nitrifying bacteria called Nitrobacter by changing the chemical makeup of another molecule, nitrite (NO2–). The nitrogen cycle has many pieces and variables that affect it, but at its simplest form, the nitrogen cycle is the transfer and use of nitrogen from organism to organism in a cyclical manner as it supports the lives of the organisms in an ecosystem. The nitrogen cycle in an aquaponics system is very controlled and has far less variables than the global cycle, and as such, is much more easily observed and explained. Nitrogen enters the system as food for the fish, and as the fish go about their lives, they excrete it back into the system in the form of ammonia (NH3). 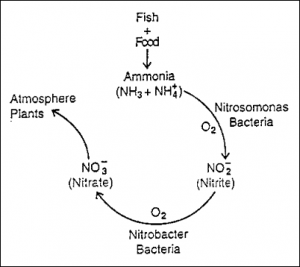 As the fish excrete ammonia, another type of nitrifying bacteria called Nitrosomonas converts it into nitrite that the Nitrobacter can convert to nitrate. Both forms of bacteria are essential to the health of the fish and plants, as even low levels of both ammonia and nitrite are toxic, while they are able to tolerate much higher levels of nitrate. 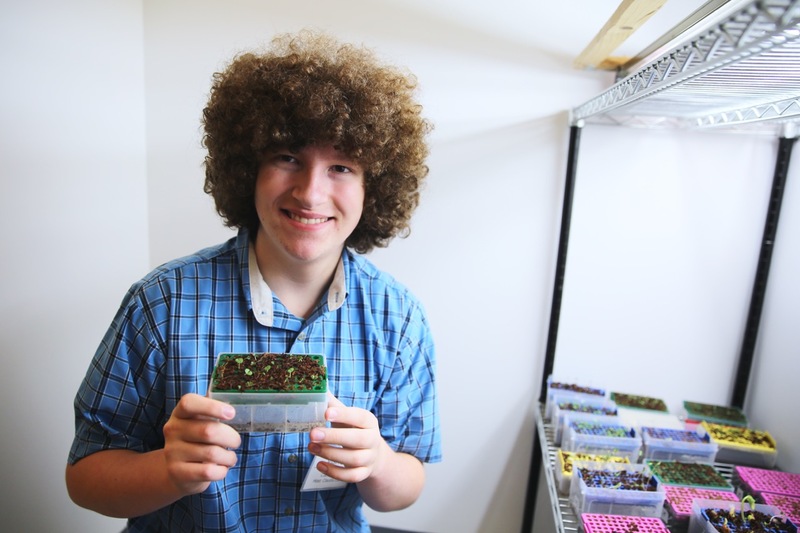 In your aquaponics system, you should be measuring specific values every two or three days. Three of these measurements should be ammonia, nitrite and nitrate. A six-in-one test strip can be used to measure pH, alkalinity, hardness, chlorine, nitrite, and nitrate levels in the water. Ammonia can be measured using a test strip made specifically for measuring ammonia. 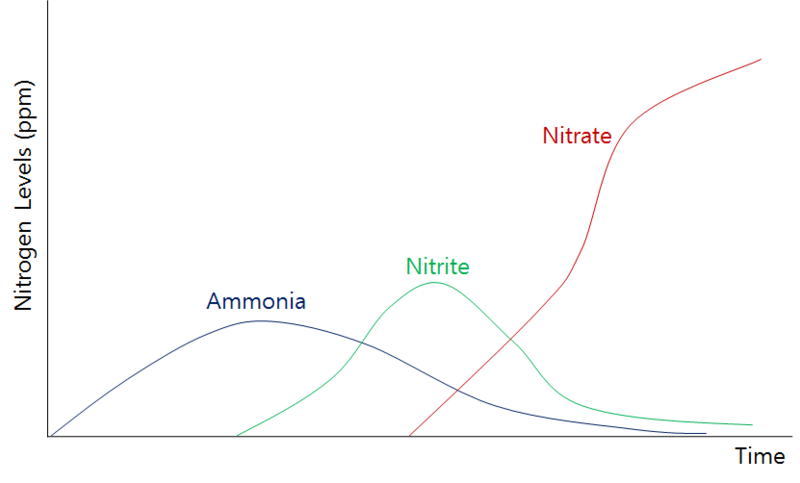 When you first start out, your system may not have very much nitrate or nitrite in it (see graph below) as the bacteria haven’t had time to develop and multiply. Eventually however, as the bacteria populations grow the amount of ammonia will drop as the nitrite and nitrate levels rise. The system will come to a point at which ammonia is being converted to nitrite the instant it is released into the system. Ammonia is being converted quickly due to substantial bacterial population. Nitrite will be converted to nitrate as soon as it enters the system. These conversion processes are immediate once your bacterial populations are established. The levels of ammonia and nitrite, if the system is functioning correctly, should begin to approach zero as nitrate levels continue to rise at a steady rate. 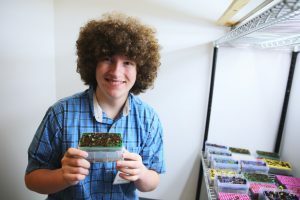 According to the Institute for Systems Biology, the recommended level of nitrate in a stable aquaponics system is between 10 and 150 parts per million (ppm), depending on the type and number of fish and amount of water they’re producing. If the nitrate in your system is much lower, the plants won’t be getting the nutrients they need in order to properly develop to their full potential. If the level of nitrate in your system is above 150 parts per million (ppm), then the plant roots could get nutrient burn, which could be detrimental to their health. Additionally, having too much nitrate in the water is also toxic to the fish and can stress them out or even kill them over time. Below are a few methods you can use to fix the problem of having too little or too much nitrate. Remember, everyone’s system is different, so before changing anything, you need to first check your levels of ammonia, nitrite, and nitrate to make the most informed decision possible. If your nitrate is low, even after your tank has completed the entire nitrogen cycling process, try one of the following (depending on your situation). Add more fish: If your nitrate deficient system does not have any excess ammonia or nitrite in it, then the problem is that there aren’t enough fish in the system to produce the necessary amount of ammonia for the bacteria to convert into nitrate. Add more bacteria: If you have a nitrate deficient system that has excess ammonia, the problem is likely a lack of Nitrosomonas bacteria. This can most likely be fixed by simply adding more bacteria into the system, which would allow the ammonia to be converted into nitrite and thus into nitrate. If your system is nitrate deficient and happens to have an excess amount of nitrite, the problem is probably a lack of Nitrobacter bacteria in the system that can most likely be fixed with the simple addition of Nitrobacter to the system. This will allow the nitrite to be converted to nitrate in a more efficient manner. To fix this issue, simply adding a little of both types of bacteria in the system. Both types of bacteria are typically mixed together can be found in a commercially made product called QUICK START. 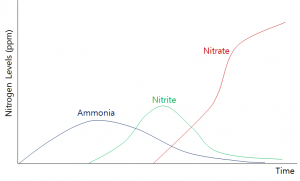 If your system is deficient in nitrate, but has an excess of both ammonia and nitrate, then the problem is most likely a lack of both types of bacteria. This can be brought on by the addition of chlorine to the water, so be careful to watch your chlorine levels and only add water to your system that has NO chlorine! Add more plants: nitrate will be removed by the plants more quickly, ultimately lowering the level of nitrate in the water. Remove fish: there will be less ammonia produced, leading to a decrease in nitrite and nitrate levels as well. Change out some of the water: remove some (15-20%) of the nitrate rich tank water and replace it with either deionized (DI) water or tap water (with the Chlorine removed first). This will help you bring the nitrate level back into the recommended range. Caution: Tap water has chlorine (used to kill bacteria) and occasionally chloramine (check your city’s water website), so to keep this water from killing your hard-working bacteria, you must let the water sit in an open tub for at least 48 hours before adding it to your tank (to remove chlorine) or add Vitamin C (200 mg per 20 gallons of water) to remove both chlorine and chloramine. Each of the three options have pros and cons. For instance, adding plants to the system will increase your overall plant yield, but it may also decrease levels of other micronutrients. Removing fish from the system reduces the amount of fish food required to sustain the fish, thus making your system more sustainable. It does, however, lower your yield of fish from the system. Finally, replacing the water in the system is the quickest and most effective method of removing excess nitrate, however, it is a short term fix and does nothing to prevent the nitrate levels from rising again in the future. My recommendation is that you choose one of the first two methods as well as replace the water, so that you can fix the problem immediately while also providing a long- term solution to the problem of excess nitrate in the system. Science is all about learning from the results of your experiment, so have fun, record your data regularly, and adjust your system based on your findings. Happy growing!